There’s nothing like the moment when your little one picks her favorite color. It’s awesome and so cute and then it becomes obsessive and overwhelming. At first it’s totally adorable when your tot asks for clothes in her favorite color, hair clips in her favorite color… But then when it becomes, “that has to be ____ (insert favorite color)!” or “I want a ____ (insert favorite color) cupcake NOW!” Then you know the favorite color obsession has hit a new level. So after a bit of drama the other day when I refused to let her only eat the red goldfish from the rainbow multi-color box, I decided it was a good opportunity to introduce how red can be lots of different colors. Yes, I want to continue to encourage her to love the color red, but also expand her horizons to seeing more than just that bright hue. Tints and shades are variations on a color, or hue. By adding white to a color you create a tint. When black is mixed with a color, a shade is created. I used to tell kids in the classroom, trying to remember which is which, to think of pulling a shade in their bedroom to make it darker — just like when thinking about mixing paint to create a darker shade. It’s never too early to introduce color theory to tots, so gathered a few materials for a tints and shades of red painting. Select your little one’s favorite color of paint as well as white and black. I also tore a few bits of red tissue paper of different shades for a bit more excitement. If you’ve got a wee tot like me, offer them a sheet of paper and then drop a few drips of the red, white, along with hardly any black on the paper. Older kids can squeeze a bit of each color of paint in three small containers to do the activity. 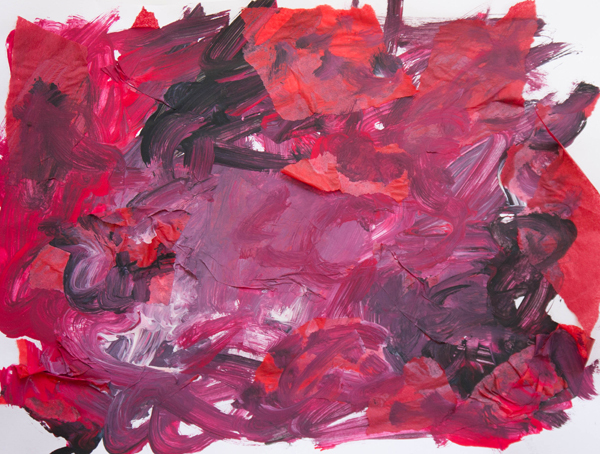 Now offer your child a paint brush and encourage her to paint the entire paper, watching what happens when her beloved favorite color mixes with the white and black. 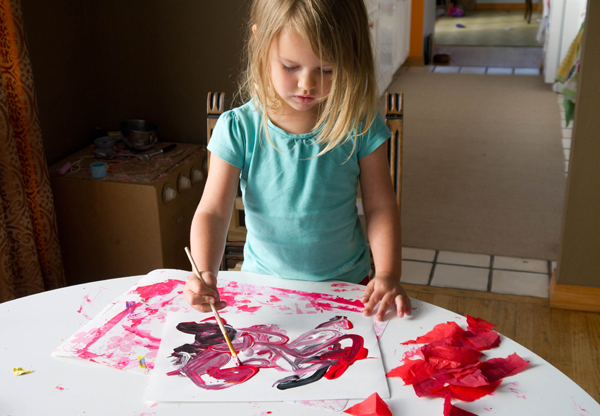 Invite your tot to paint and press the tissue paper on her paper to see how the color changes. Keep painting until all the white paper is covered. Add a few drips here and there as needed. Let the paper dry and then find a special spot to display the tints and shades creation!